in St.Germain. The Arctic Warrior 1k Kids and 5k or 10k Snowshoe Race will wind you through the beautiful trails in St. Germain and alongside the obstacle course race. 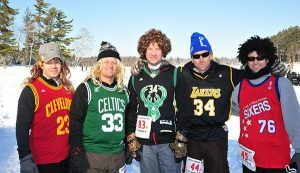 The Arctic Warrior 5k or 10k Obstacle Course Race will wind around Little St. Germain Lake and through trails of towering pines that will challenge you though variety of adventure obstacles including: a stuck in snow tire shuffle, arctic stair challenge, frozen switchback climb, snowy tundra tunnel crawl and a frozen tire bike race to name a few. The Obstacle Course Challenge is a Team event so bring your friends along (team sizes can range in size from 2-6). The Most Spirited Arctic Warrior Team will be recognized at 3:30 at the Wild Bear Grill & Pub. Proceeds from the Race will be shared with the St. Germain Non-Motorized Trail System Fund.